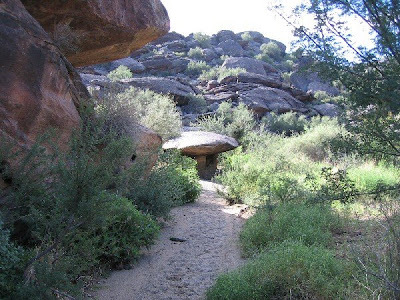 Although this was a very popular spot at South Mountain in the past, it's almost unknown to the general public now. On any given Saturday when there are hundreds of people on National trail you can visit this area and be alone for hours even though it's only 50 yards off National...it's just that well hidden. Surprisingly, even though it was an official attraction at one time with reinforced (CCC?) trails leading up to it, it's off the maps now. 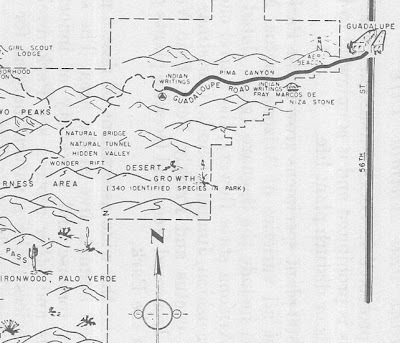 Here's a section of the Official 1964 South Mountain Park brochure map showing Natural Bridge near the Natural Tunnel. 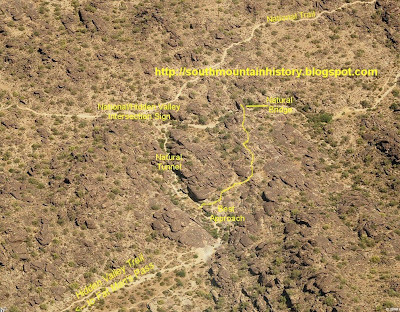 Note that Mormon Loop trail is missing because it hadn't been created yet. Also Fat Man's Pass was called Wonder Rift on this map. Too bad it's not on the maps any more, it's a really neat place to visit. As requested here are directions to the Natural Bridge. Please do not approach from National Trail, that approach is closed for revegetation. The approach from Hidden Valley was part of the original official trail (look for small CCC work on part of trail near bridge) This approach does not have any signs showing the old trail as being closed. 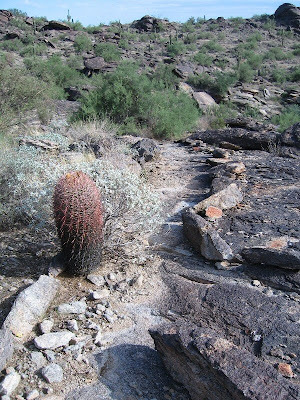 The old trail (facing north) is lined with many small rocks. I remember you posting about this on MTBR a couple years ago. 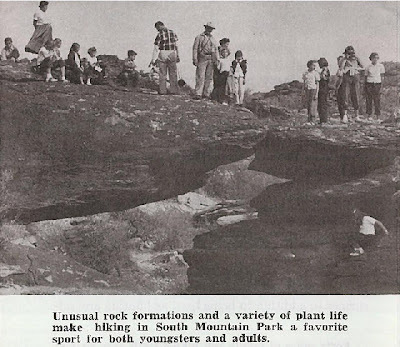 Can you share any clues on the location of the Natural Bridge? One comment on the Mormon Trail, it does show on the 1964 map as coming up from Neighborhood Canyon, as well as being named and shown on the 1934 master plan map. The article was referring to Mormon Loop Trail (not Mormon Trail) Mormon trail starts at 24th street and ends where it hits National Trail. The Mormon Loop Trail is a connector between Mormon and the beginning of National. Mormon Loop and National are the two ways to get to the top of the mountain from Pima Canyon, where Mormon comes up the North side. Thanks for the image/map. 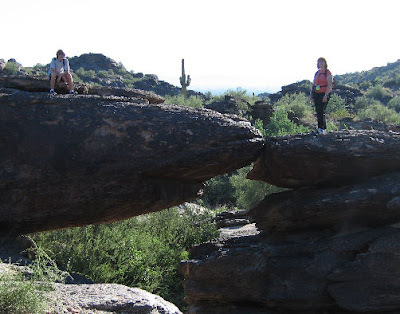 I'm looking forward to a family hike out to see the bridge once it cools down. I'll have to check it out on a ride soon too. I finally made it out to the natural bridge today--thanks for your clear directions.